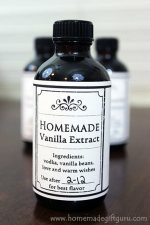 Don't you LOVE plenty of great options for creating homemade Mother's day gifts?! Yes indeed... I'd say Mother's Day is the PERFECT occasion for creating homemade gifts. Mom doesn't care about how much $ you spend, but knowing how much you love her, that is valuable. Moms deserve the world, after all... they grow humans, they love and nurture like no other. No one can take the place of your mom. "Mothers hold their child's hand for a moment and their heart for a life time." ...being a mom, I can say this is so true! I encourage people young and old to create homemade Mother's Day gifts. Homemade Mother's Day gifts are the perfect way to show how much you care. 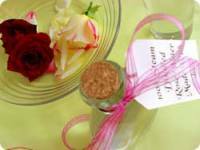 The following homemade gift ideas for Mother's Day are easy enough for kids to either make or at least help with, yet they are also the type of Mother's Day ideas adults can enjoy and feel good about making. So whether you are looking for ideas for the kids... or whether you are an adult, looking for a thoughtful gift to make for mom, you've come to the right place. I hope these Mother's Day gift ideas inspire you to create something truly special for the mom(s) in your life. Framed photographs make great Mother's Day gifts. 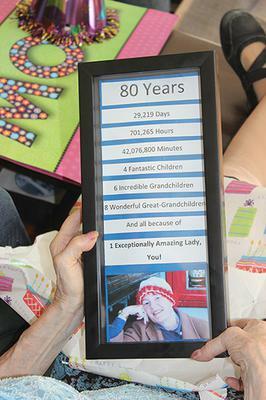 In fact, you can use any of these 10 ideas to create your own photo frame and then use it to frame a photo that will mean the world to your mom or grandma. Mom or grandma when she was a child or a young woman. Mom or grandma with her kids or grandchildren. Just her beloved kids or grandchildren. Or you can frame a quote, bible verse or even several special messages for your mom like I did here... simple decoupage frame for daily inspiration. She loved it! 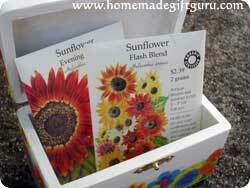 Another fun and frugal homemade gift idea for Mother's Day, is to frame dried pressed flowers. You can seal them with Modge Podge, spray them with acrylic sealer or simply frame them under glass. Accordion cards are so fun to make! We've made them for Mother's Day, Father's Day, Grandparents Day and even Valentine's Day. Accordion cards are a simple way to give (or even mail) a super caring and creative gift... and they're so easy. Some of our favorite things to put inside accordion cards include, photos, drawings by the kids, handprints and footprints, poems and hand written letters. 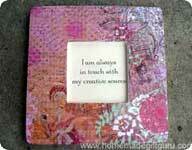 Each segment of your accordion card is an opportunity to frame something special and meaningful for your mom. Learn how to make "Kid Inspired" accordion cards here! Once finished, an accordion card becomes a wonderful adventure, full of memorabilia, love and/or sentiment. 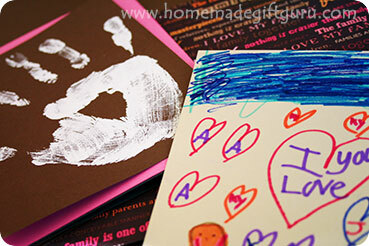 This makes accordion cards a perfect choice for homemade Mother's Day gifts. 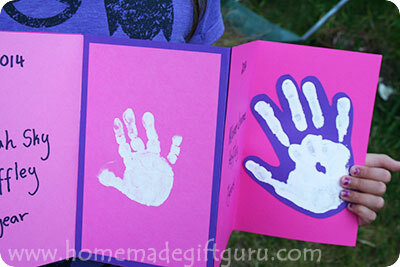 Hand prints and foot prints from the kids can be used to make some very sweet and thoughtful homemade Mother's Day gifts that she will cherish forever. In fact, the longer she has them (and the bigger her kids get) the more priceless they will become. 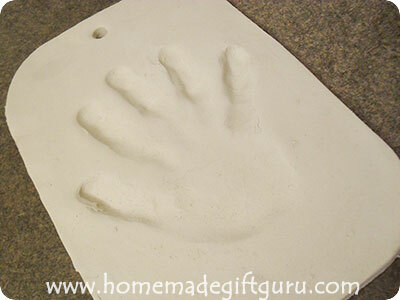 One of my all time favorite ways to preserve the memory of just how little my kids once were, is to make handprint keepsake gifts using clay. I've made these for my husband and most certainly for my kid's grandparents and great grandparents. They make a GREAT Mother's Day gift! Making a wreath for Mother's Day couldn't be more fun! For moms who love their gardens, try making a wreath using packets of seeds. After-all, May is the perfect time for planting seeds! 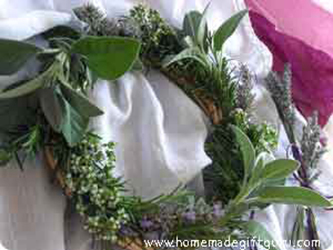 Mother's Day is also a great time for cleaning up your herb beds... so if you have a lot of growth on your perennial herbs, try making a seasonal herb wreath using whatever herbs you have in abundance. Herb wreaths smell so good! 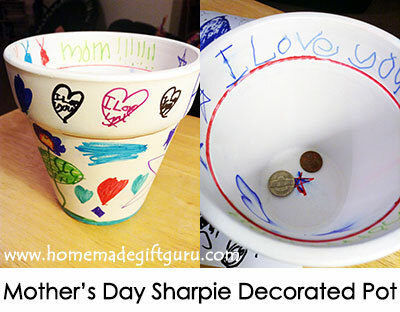 Kids and people of all ages can create fun gifts for Mother's Day, using sharpie markers. What kinds of things can you sharpie for mom? Sharpie Decorated Terracotta Planter Pots. 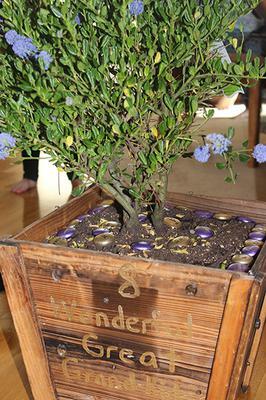 You can use regular sharpie markers to personalize a terracotta planter pot for mom. Start with a painted or unpainted terracotta pot. Draw cute little messages, poems, quotes, designs... trace the kid's hands or simply let the kids do it all like the ones shown to the right. Once you are done decorating the pot, you can set the sharpie ink by baking the pot. To bake, put the finished pot in a cold oven and heat to 350°F/180°C. Once the oven is hot, bake for 30 minutes. Then turn the oven off and let your project cool in the oven (leaving it in there overnight works best). For further protection, you can spray acrylic sealer onto your project, after it's been baked and completely cooled down. For better weather resistance, you can use oil based paint markers like these, rather than plain sharpie markers. Sharpie Pillows and Other Fabrics. Sharpie markers can work great on fabrics. One of my favorite fabric items to sharpie are decorative pillows. You can draw freehand or use stencils, whatever fits your vision for mom. Stencils can help you make a flawless design and/or lettering. To set the sharpie ink, it's best to iron the pillow case on high after you're done. I don't recommend washing sharpie decorated pillows because the art will eventually fade. Helpful hint... For the very best performance, the Sharpie Stained line of fabric markers are specifically designed to resist fading when washed and as a bonus, they don't require heat to set the color. 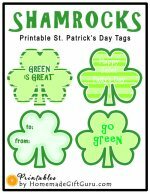 Other fabrics people love to personalize with sharpie fabric markers include: t-shirts, tote bags, shoes, baby bibs and onesies, hats of all sizes, aprons and even home decor such as lamp shades and curtains. Coffee Mugs other Ceramic Surfaces. Personalized coffee and tea mugs are a fun homemade Mother's Day gift idea. A lot of people say you can use a regular sharpie marker to personalize mugs and other ceramic surfaces. While a sharpie marker will work, it probably won't last forever, especially if you plan to wash the surface. If the item is for decorative purposes only, you can bake it and spray it with acrylic sealer, which will provide decent protection. Fret not however... if you want to design personalized ceramic gifts using markers and you want them to last a long long time, I recommend using oil based paint markers like these. These markers are specifically designed for use on glass, metal, stone, wood, papers, mirrors, porcelain and clay. Either way, you can make some pretty fun designs on various ceramic surfaces. Plus it's easy to find great ceramic stuff to use for your canvas just by shopping at dollar stores and thrift stores. Whether you are letting the kids scribble all over a mug for mom or you are designing an artistic masterpiece, personalized mugs and glasses are a fun and inexpensive homemade Mother's Day gift idea that can be made perfect for your particular mom. 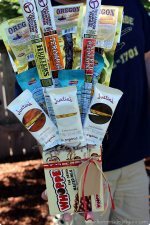 Candy bouquets are a creative way to give sweets to a sweet mom... therefore, Mother's Day is a GREAT occasion to give a homemade candy bouquet. 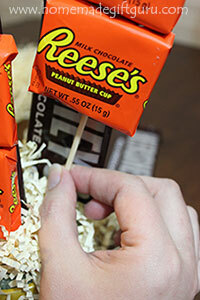 Use your mom's favorite type of candy, whether that's peanut butter cups, dark chocolate or sweet and sour goodies. For a homemade Mother's Day gift candy bouquet that's personalized by the kids, try making these candy arrangements BUT start with a 4 inch terracotta pot decorated by the kids. Gift baskets make lovely homemade Mother's Day gifts. A homemade gift basket is a great way to shower mom with sweetness. and for the extra health-conscious mothers out there, healthy "wellness" gift baskets are a perfect way to spoil mom! Here's my instructions and a few helpful tips for making great gift baskets. 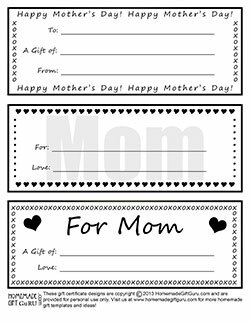 These homemade gift certificates for MOM and also these all occasion gift certificates can be printed for free and used to give mom a gift she truly wants. Whether that gift is free hugs and kisses from the kids, some quality time with you, a home manicure, a back rub or (one of my favorites) breakfast in bed. I love it when my kids make me homemade Mother's Day gift certificates for things like "breakfast in bed" or "kids clean up while mom relaxes." And I'll take a "HUG" gift certificate any day. Wondering what other HMGG readers like to give? To submit your own ideas: Go to the HMGG reader gallery or reach out to other readers here. Father's Day is coming up... you may also like these free printable gift certificates for DAD!